Desert Living, fantastic in the winter months! Southern California offers such a rich diversity of wonderful places to live! If you have the means, you can choose to also have a second or even third home! Why not? A home in the desert, whether it’s your primary, secondary or tertiary, is very desirable for so many reasons, as people who have been here know. During the winter and spring months, it’s simply divine weather here, for the most part. Surrounded by mountains, groves of palm trees, blossoming trees and colorful flowers in great abundance, what is not to like? Rain is unusual, and so hiking, biking, golfing, tennis, swimming and horseback riding are the order of the day. Or watching polo games, shopping along El Paseo, dining at our many restaurants may be. It’s all up to you! At night, there are the casinos, or concerts and top entertainers at the McCallum Theatre, or take in a newly released hot movie. So much to do, so little time! The fabulous modern contemporary home pictured above is in Palm Springs, however each desert city offers its own charms and attractions. Palm Springs has the world class cachet and world recognition, but some of the best luxury real estate in the desert can also be found in Palm Desert, Rancho Mirage, Indian Wells and La Quinta. During the year, you might get the itch for some Big City excitement. What better place to go than the new L.A.Live area, the new Times Square West area, around the Staples Center of downtown LA? 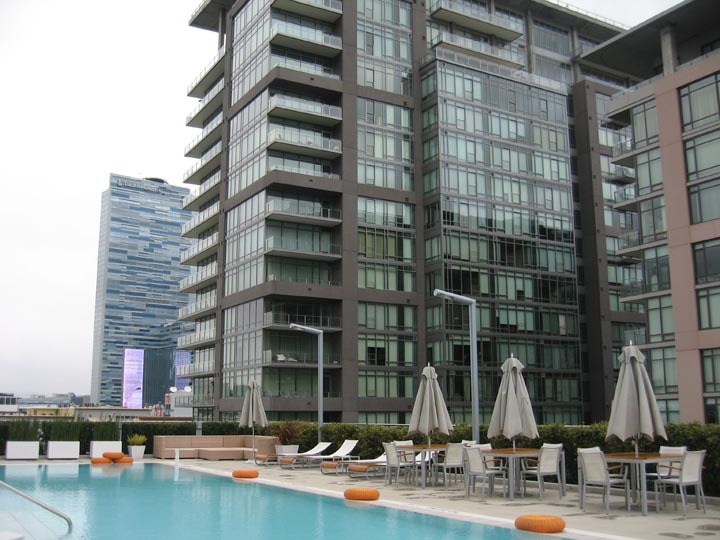 Fabulous new condos in downtown LA! I explored some of the new condos in downtown LA, and I was impressed! I took the photo above from the pool area of the EVO condos, a 24 story, eco-friendly constructed complex. The two sister condo buildings at the left of the photo, the Elleven and the Luma condos sold out immediately when they were completed during the hey-day of real estate buying, just before the 2008 crash. There are some resales in there now, some short sales and some foreclosures, for the bargain-hunting buyers. However, at EVO, which is brand new construction, there are now only 30 units left to buy. The great downtown location with all its entertainment venues, along with many amenities that come with the condos, and most importantly, the spectacular views afforded by the walls of glass, combined, make these condos quite attractive indeed! Prices at EVO start at around the low $500,000s. I understand that it’s mostly owner-occupied in these condos, which attract mostly professionals who work in downtown LA, but also many empty nesters. To step it up quite a few notches, there are the fabulous new condos at the Ritz-Carlton Residences. This building can be seen to the far right of the photo above, and is a spectacular, blue-hued tower that sparkles at night. I learned that they just closed escrow on their first condo residence just recently! About one third of the condos are still available, and most are still waiting to be completed. These condos with spectacular floor to ceiling views have attracted top entertainment figures in music and sports, as well as those who can afford this level of luxury and want to be in the midst of all the excitement that L.A. Live has to offer. Don’t forget the Walt Disney Hall is close by as well as too many interesting markets, venues, restaurants and attractions to list here! Prices start at around $800,000 and the amenities are top-notch, as you can imagine! Finally, on a hot day, where else would you want to be but at the beach? 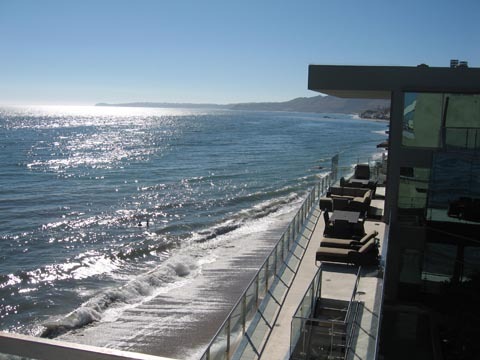 And perhaps the most amazing stretch of beachfront properties to be found in the world are in Malibu! To have a house on the beach in Malibu would be like a dream come true in many people’s minds, and there is quite the variety of homes to choose from along this rarified 27 mile stretch of shoreline. Spectacular views from this newly built Malibu beach house! Last time I looked, they were asking $14 million for this newly constructed home with this to-die-for view of the Pacific Ocean. I have a feeling that if it is still available, it is listed for considerably less. However it does have a great location on Malibu Road, very near Malibu Colony, which is gated and perhaps the priciest real estate in Malibu. If you watch the Bravo show “Million Dollar Listing” like I do, you can see that there are spectacular houses on the beach in Malibu listed for in the $5 million range now. Amazing but true! Now that our MLS encompasses real estate from the desert to the sea, I can help you make your dreams come true, from a fabulous desert getaway, to a condo in the midst of the excitement of downtown LA, to the best beachfront property perhaps in the world!